Grease is one of the more stubborn stains to get out of any material. You must dissolve it to remove it from the fabric. Laundry detergent normally doesn't have the power to remove grease on its own--the task takes a degreaser. When you get a grease stain on a down coat, its important to get rid of the stain without damaging the down or outer shell. Spread the coat out on a hard, flat workspace so you can reach the grease stain. Place a few drops of dishwashing detergent on it. Gently rub it in with your fingers. Allow the grease stain to set undisturbed for a couple of hours, says mrscleanusa.com. Wash the down coat by itself in your washing machine. Choose a "Large" load setting. Set the water temperature to "Cold." Use a gentle cycle and a detergent that cleans well in cold water. You'll need to push the coat down into the water in the machine until the down becomes wet and heavy. Remove the down coat from the washer. Check to make sure the grease is gone. If not, repeat Steps 1 and 2. If so, proceed to Step 4. Place the coat in your clothes dryer. Set the dryer on "Low" heat. 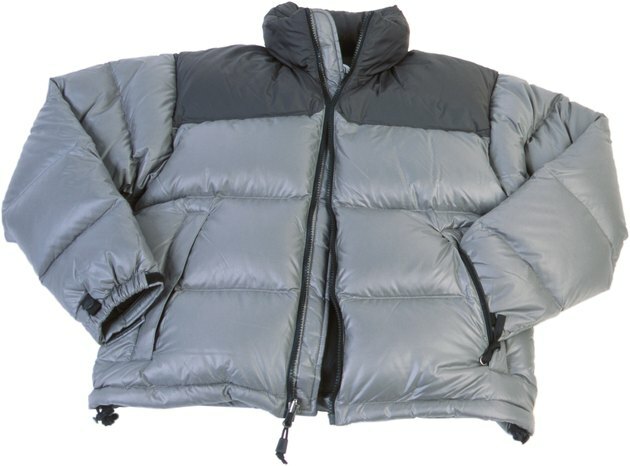 How long it takes the down coat to dry depends on its size, how wet it is, and your dryer. It will take approximately an hour for a medium-sized coat.